The VGF has been applied to inform and assess land susceptibility in the Corangamite Soil Health Strategy. Here the VGF provided a hierarchy of land resource information previously unavailable to the Corangamite CMA region. Using the Land Use Impact Model (LUIM) and susceptibility ratings assigned to the land resource units, the LUIM generated risk maps that incorporated land use practices and threats. An example of a land susceptibility product using the VGF for land susceptibility information is provided below. Wind erosion risk in the Mallee region is an example where land use information, remote sensing approaches and the geomorphic divisions provide elements to define management practice combinations that influence the occurrence of wind erosion. The VGF and alignment of existing land systems descriptions of Rowan and Downes (1963) provided the susceptibility descriptions from which to rate wind erosion hazard to the landscape. A third tier unit of the VGF (historically known as the ‘Tempy land system’) was disaggregated using a digital terrain model to delineate landscape components within this system. These components were assigned wind erosion susceptibility ratings as part of the LUIM analysis for the Mallee region. The difference between applying Tier 3 and Tier 5 to this analysis of wind erosion susceptibility is shown in figures below. 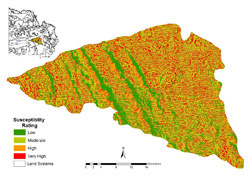 Recent provision of higher resolution soil and land information for the Corangamite CMA region in ASRIS has been used in catchment hydrology modelling such as the ‘Sawlogs for Salinity’ project that aims to address catchment salinity priorities through plantation forestry. Projects where the VGF was used and how it was applied are described in the following project examples. The approach for this project uses the VGF to define the landscape/terrain variants (e.g. hill, plain) and landscape components (e.g. hill crest, hill slope, drainage depression) that are interrelated with soil systems. These soil systems represent soil zones where the degree of soil variability can be better anticipated, therefore reducing the density of exact analytical measurements required. This translates into significant cost savings in sampling for land managers and greater confidence in precision of mapped soil property outputs. The Wimmera CMA region comprises four broad geomorphological divisions including the North West Dunefields and Plains, Western Uplands, Northern Riverine Plains and Western Plains. The VGF provides spatial context to assess landscapes at detailed scales including subdivisions of the geomorphology and the relationships between soils and landscapes. Second and third tier geomorphological divisions have been described. This project mapped potential areas of the West Gippsland CMA region for soil erosion processes including sheet erosion, landslips and gully erosion. 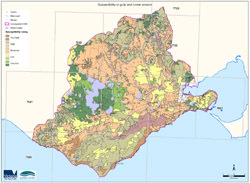 Using the LUIM risk assessment framework, soil and landform information integrated into the VGF from previous land resource assessment mapping was classified for map unit inherent susceptibility to threatening processes. Landslip and wind erosion susceptibilities were assessed by GRG member Ian Sargeant. Soil-landform studies that underpin the VGF were used to define groundwater flow systems (GFS) for the Port Phillip region. This soil-landform information embedded in the VGF was modified and interpreted with consultation from GRG members to define GFS units.